Emmanuel Jal's story is an inspiring personal journey of survival: During the second Sudanese civil war in the 1980s, his mother was killed when government sympathizers raided their village. At seven, he was recruited as a child soldier and held at a training camp disguised as a school. He and others escaped and traveled on foot for months before reaching a safe haven. At age 11, he was adopted by a British aid worker named Emma McCune and taken to Kenya. After she passed away, Jal lived in the slums. He fell in love with the hip hop sounds he heard on the street and discovered that music enabled him to talk about his feelings and experiences and relate his story to everyone he met. Next, he traveled the world singing his songs. Today, Jal has several albums as well as an autobiography, a documentary and a TED Talk (all called War Child) to his credit. Yet, it wasn't until he was asked to star in The Good Lie, this fall's hit film about Sudanese refugees starring Reese Witherspoon, that he felt like his story had come full circle. 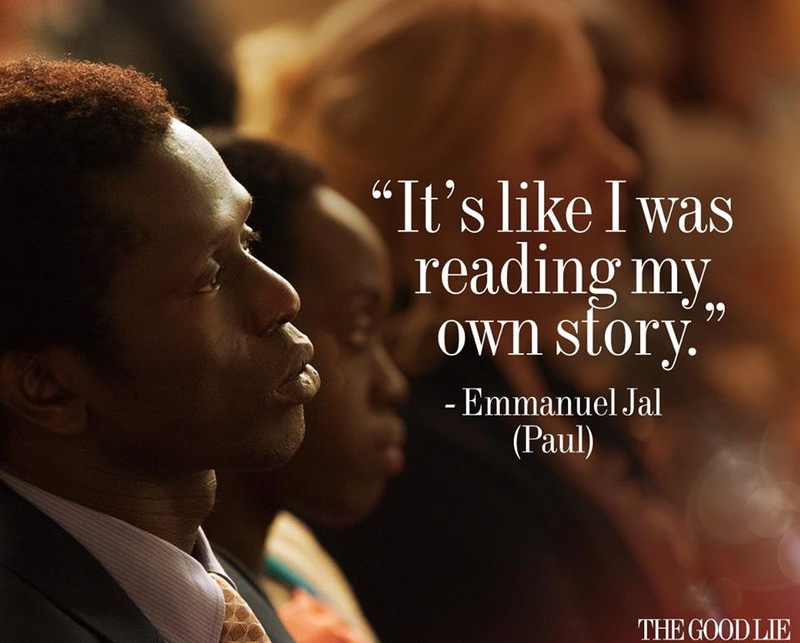 Jal's character, Paul, struggles to find his place in America after leaving a refugee camp in Africa, but realizes he has the strength to endure anything. Jal's latest album, The Key (which contains the track, "My Power," featuring Nile Rodgers and Chic), was released a few weeks prior to the movie and shares its themes of power over oppression and faith before fear. "In some ways, it was difficult, because we were trying to replay our lives. It brought back painful memories. The director did a good job and told me to play it like poetry. Reese [Witherspoon] told me to immerse myself in my character. 'This is for your people,' she said. We collected advice and watched the other actors. My crying scene was the most difficult part for me. They put those drops in my eyes to make me cry but they did not work. So, we kept trying. I had to be frustrated and remind myself of the difficult times of my childhood and channel those memories. And that's what actually made me cry." The whole movie is entertaining. It's my story and the story of my brothers and sisters, the story of my country. It's the voice of the dead. It's no longer just our story anymore because there are other people involved in it. Now, it's the story of humanity. It's about hope. Those who have nothing to hold onto really find it hard to wake up the next day. Faith gives people hope to want to see tomorrow. There's always something humans will believe in when they are facing atrocities. What I find exciting is the complete story that's been told. I've been trying to tell it through music, to put a spotlight on South Sudan. I have a book and a [documentary] and an album called War Child, and I go sing at schools. But with The Good Lie, this story is now complete and it's going to create a conscious global awareness about South Sudan. This story is going to ignite hope. Those who are going to see their stories heard, they have hope. It's a story that keeps hope alive for so many people. What is hope? Hope is faith that tomorrow is going to come. Hope is what makes you believe that things are going to be better. When you let hope die, then your body begins to poison you. That's when depression gets a hold on you and you become enslaved internally and lose the will to believe that a better day will come. The Good Lie is a story of hope. It's happening all over all again. The people who are outside in the bush don't trust the government. The government is silencing the voice -- the cry for freedom, justice, equality for all. The last time I was there (a couple of years ago) to do a peace concert, I was beaten. I was warned, 'We don't like activists here.' They basically were telling me not to open my mouth. I met him before at the United Nations and again for the We Are Family Foundation. I was given a peace award there. Then I got word that he wanted to do a hit song with me. We had time to talk about music and he gave me a few tips. It was an amazing experience to talk with a legend. We spent more time talking about music than actually doing the song. We went into the studio together. It was great. We worked on it overnight and the next day I flew out. He's amazing. He told me four things: He told me to think about your flow, your hook, your rhythm and then your lyrics. We have a lot of young kids who just don't care about the lyrics. They want to see the talent first and they like the way you're going to deliver the song. Then focus on the beat and you'll get them hooked in. He said don't forget your village, always bring it to the hip hop. The Good Lie movie is released on digital HD format December 9 and comes out on DVD/Blu-Ray Dec. 23. The Key album is available on iTunes.